In recent years, the Indian Navy has positioned itself as a “first responder” of sorts along the Indian Ocean littoral. In 2014, it responded to a water crisis in the Maldives. In 2015, it evacuated civilians from Yemen as the Saudi-led coalition began air strikes. Less recently, the Indian Navy and Army played a major role in supporting Bangladesh after Cyclone Sidr in 2007 and Myanmar after Cyclone Nargis in 2008. For New Delhi, responding early to crises has been a priority across the current government and its predecessor. Most recently, the Indian Navy has played an important humanitarian assistance/disaster relief (HA/DR) role along the southern African coast, in Mozambique. Last week, the Indian Navy announced that upon receiving a request from the Mozambique government in the aftermath of a category four tropical cyclone, it diverted three Indian Navy vessels—INS Sujatha, INS Shardul, and INS Sarathi—to the city of Beira along the country’s coast. “In this hour of tragedy, Government of India stands ready to extend support to the affected people,” the Indian Ministry of External Affairs noted in a statement. A second statement published on Saturday underscored the effect of India’s early assistance, noting that over multiple days, the three Indian vessels had rescued more than 192 people in Mozambique. “Medical assistance has been provided to 1381 persons in medical camps set up by the Indian Navy,” the statement further noted. The statement used the phrase “first responder” quite literally to describe the role played by the Indian Navy, underscoring this as one India’s longstanding strategic roles in the Indian Ocean littoral. New Delhi has long used its humanitarian assistance/disaster relief credentials in the Indian Ocean to underscore its role as a state supporting the global order. “By contributing its resources to prevent or mitigate regional and international crises, India is demonstrating its commitment as a responsible actor in the international order,” the Indian Ministry of External Affairs had noted in a white paper on its first responder role in the aftermath of natural disasters, crises, and nontraditional security challenges. For more than a decade, too, India has been focused on building interoperability with regional and extraregional navies to better coordinate HA/DR missions in the event of major crises. The 2004 Indian Ocean tsunami proved to be a formative experience in this regard. 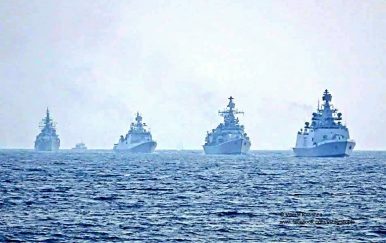 In subsequent years, the Indian Navy has conducted HA/DR exercises with the navies of the United States, Japan, Australia, Singapore, and other countries. Above all, for India, exerting a strong HA/DR presence in the Indian Ocean is far from just altruistic—it yields real strategic benefits. It underscores the capabilities of the Indian Navy, which has demonstrated its ability to sustain long deployments across the entire breadth of the Indian Ocean region. Moreover, by acting as a “first responder,” the India not only shores up its credentials as a responsible rising power, but it also leaves other navies in the region playing a secondary role. India can emerge as a maritime security leader with African states bordering the Indian Ocean.